Community members are being invited to dedicate one day’s income to charity to mark AFED’s Solidarity Day on 15th Sha’ban (21 April). The funds raised will help less fortunate families with schools fees, medical costs and household needs. 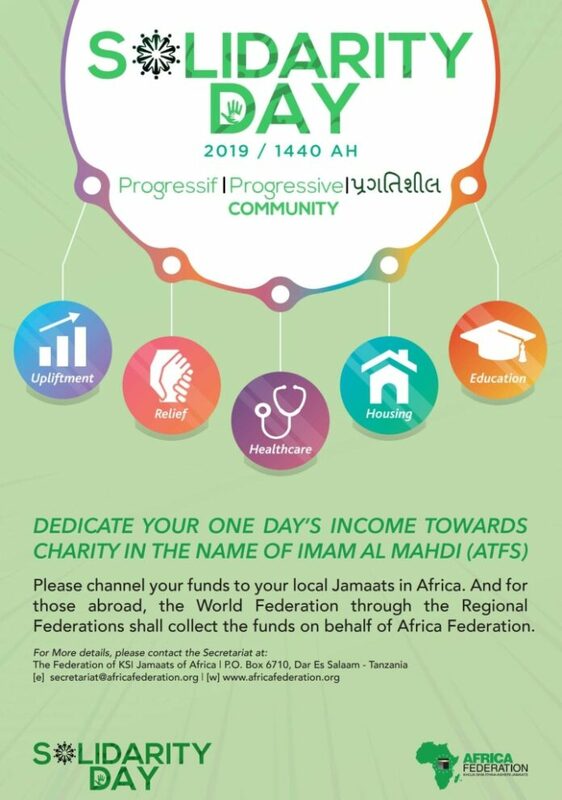 The date has been designated AFED Solidarity Day, a definition of which is “unanimity”, and the call from AFED is for every member of the community to make a donation in the name of Imam al Mahdi (ATFS). Members can make their contributions (Zakat, Sadaqah and General Donations) to the Africa Federation either through their local Jamaat or to the AFED Secretariat head office in Dar es Salaam. Those overseas can make donations through regional federations which will collect funds on behalf of AFED. “Contributions from members, as always, will make a great difference to the deserving beneficiaries,” Mr. Karim said.